The combination of a superb microclimate, a dash of designer brands and a constant stream of celebrities, from Hollywood A-listers to reality show wannabes, means that Marbella can pretty much ignore the political bun fighting that is going on in Spain and get on with the serious business of having a good time and making money. It’s not all tourists and celebs, however. The past 12 months have seen the luxury residential property market show real growth. Property values have historically been very high, and although the recent economic crisis resulted in a realistic realignment in prices, the past few months have seen values begin to rise as international investors are once more being lured in by the country’s low prices, investment opportunities and lifestyle. International property analysts have highlighted three prime areas for international investment – Madrid, Barcelona and Marbella. Foreign investors have been attracted to Spain due to the ‘Golden Visa’ scheme – which grants automatic residency to non-EU citizens who invest €500,0000 or more in Spanish property. This has has attracted a growing number of residency investors, mainly from the Far East, Middle East and Russia. 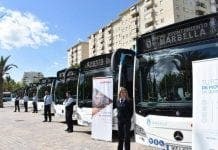 Meanwhile, Marbella Town Hall has also been proactive in marketing the town, attending a variety of trade shows and exhibitions in the mentioned regions. It is not exactly a hard sell. Internationally renowned as a playground for the rich and famous, Marbella boasts literally miles of stunningly beautiful beaches, is a favourite spot for golf enthusiasts and has an enviable climate. The increasing number of high profile events is adding a sprinkling of stardust to the already eclectic social calendar. The Marbella Luxury Weekend showcases designer fashions, top-end goods and some seriously impressive yachts and cars, while the month long Starlite Festival this year features Lenny Kravitz, Enrique Iglesias and Lionel Richie and always attracts media coverage like moths to a flame. As do the red carpet charity galas held by Antonio Banderas and Eva Longoria, now a regular fixture on every Marbella socialite’s calendar. 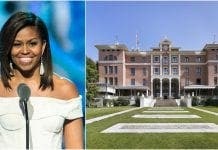 Even US First Lady Michelle Obama’s visited Marbella a few years ago, an event which made front pages around the world and – according to the town hall – brought in €800 million in media coverage. Restaurants such as La Sala and bars including the famous Linekers are ‘must do’ destinations for the hordes of fans wanting to imitate their TOWIE idols or bump into a Premiership footballer or two and, though they might not be to everyone’s taste, they certainly bring a dash of colour to Banus! 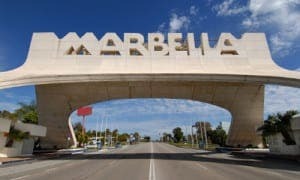 Written off several times before as being past its sell by date, Marbella continues to attract a steady stream of the rich and famous, and is set to do it all again and this summer! MARBELLA began its life as a town in the seventh century BC, when it was a Roman settlement called ‘Salduba’. This is also the name of a well known bar at the entrance to Puerto Banus that has been there for centuries too. Meanwhile an original Roman bridge (above) still stands surreally in the middle of the Puente Romano Hotel and a few kilometres away is the restored Roman villa at Rio Verde with its beautiful mosaics. A sleepy town during the period of Al-Andalus, Marbella was retaken by Christians in 1485. The Plaza de los Naranjos (Orange Square) has been the focal point of the town since then and the town hall is still located there today. Sorry Giles too towied up,too many chavs and now too accessible…… I’m there all the time…..I wish I didn’t say that now!!!!! Marbella lives on it’s past when it had celebs like Connery living there. Still talking about Michelle Obama 3 day visit after 5 years! There is money around in Banus but not class, can all be a bit seedy. Townie fame is the last thing it needed. Two stabbings in one day last week, tells you a lot about this area. @Marion it would appear that every posting you make regarding Spain is full of animosity, don’t know why and don’t really care, but perhaps Spain did not live up to your expectations or things just went bad for you. But you must remember also that there are thousands of expats from various nations that live here, quite happily I might add, and know very well what is happening in Spain. Those that suffer here are no different from people suffering anywhere including those that are in England and perhaps you could warn expats that are perhaps thinking of returning to the UK of all the bad things the same as your postings about Spain. Therefore may I suggest that your posting be directed more to the English press but also mention that all properties in Spain are not illegal and that many hundreds if not thousands of expats are quite to happy to purchase and to live a happier life in Spain. Sales of properties are increasing (legally) and most of the sales are to Brits which indicates the attraction of living in Spain is greater then perhaps living in England. Wonder why, considering all the rhetoric by the English media regarding Spain. It’s that bad even the rich and famous are purchasing here (even the richest man in the World has purchased here) and thousands are flocking here for their holidays and if people are not contented there is also a voting system, not only in the UK but in Spain also. wonder why, perhaps it’s due to people involved with the sale are now spending time. In real life the rich and famous buy or holiday on the Côte d’Azur. Marbella gets the Towies! Jacko, you say that you “don’t know why and don’t really care”, but obviously do you care enough to post a long comment about it. I think you should refrain from telling people how and what to post, otherwise people will think that you come across as arrogant. Just saying. That is naïve thinking because this is actually something that cannot be determined at the outset of moving to a country. After a decade of seeing people move here, and then away again, you can only see the attraction of living somewhere after living there for a considerable period of time. People often think that they will have a “better life” moving abroad, but of course moving abroad does not automatically solve all of a persons problems that they had in their home country. If anything, it brings more challenges and problems (jobs, finances, language, culture, etc). Many people do like their life abroad, and good luck to those who do – but it’s never plain sailing. Perception is very different from reality and of course a retiree would have a completely different experience to family who come to live and work. I’d wager that the rich and famous do not live the same life in Marbella as the vast majority of expatriates; they mostly move to gated communities and mix in very small and specific circles. Do you think Mr Connery’s life was really like the average expats who move with their children to rural Spain and try to earn a living, for example, or like most retirees on a modest pension? Marbella is a bubble and is not representative of all of Spain. Just some constructive criticism for you anyway. @Marion, for a start I didn’t mention “Marbella” once and was merely giving my opinion which is equally as valid as yours and an overall picture of Spain which you also tend to do. Just what is your beef about Spain and do you actually live in Spain. Why do you single out my post but ignore the one from pg above which is equally negative?? He thinks it is Towied out too. Unless you think they are the rich and famous ones! Stefanjo, quite right, and when you manage to catch those nit’s you normally stamp on them. Btw, the wording of your sudden input gives the impression, to me at least, that those in question, ie, Marion and Fred are perhaps nit’s. I think if you also look back I did mention the name Marbella perhaps a few times. What was it you said, ah yes, “goodness me Jacko, you sure can pick those nits”. Da. Marion, by the sound of it pg either lives there or almost lives there. Besides my response was to you. Btw way you didn’t reply to my question as to where you live, England or Spain. Fred, personally I don’t really care and don’t know why Marion has this animosity as it does not effect me and your response is perhaps as long as mine. Talk about calling a kettle black. I think you should “really” read what I had said and perhaps understand what had been written and perhaps you would find the answer’s to all the negative questions that your long response was asking. Fred, I shall just point to one remark that I made (among st many) and to your response. You can squirm but it won’t help Jacko. You were the one who mentioned Mr Connery, who llived in Marbella, and the whole story is about Marbella. You are getting desparate now. Methinks we’ve seeen “Jacko” before elsewhere folks. I won’t feed this troll from now on. Fred doesn’t need my help, but goodness me Jacko, you sure can pick those nits. The ARTICLE is about Marbella, it’s hardly surprising if the dirty old town is referenced in comments. Beware of slipping into troll mode jacko???? Would anyone buy a house cos Angelina Jolie (whoever, insert your own celeb) might buy. They wouldn’t be inviting you to dinner and joining the expat scene would they. We do a different travel supplement each week in the printed paper and therefore focus on a different area for two weeks – last issue being Marbella. Next issue is Fuengirola so expect to see plenty of Fuengi articles popping up.